With this no-fuss swag, setup is effortless. Simply ‘bags’ your spot in the wilderness, throw the swag down, unroll, pitch and get comfy under the stars! 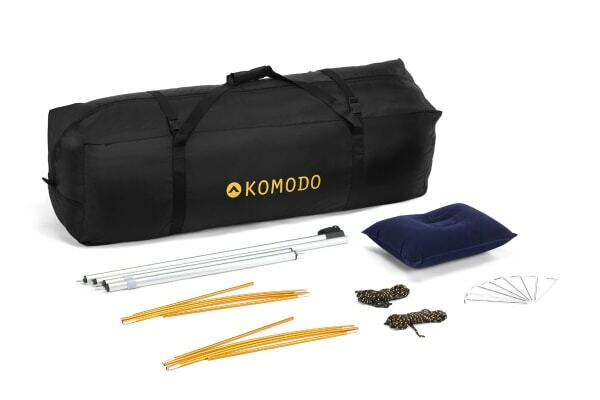 The ultimate addition to your next weekend getaway, festival or camping adventure, the Komodo King Single Freestanding Swag is effortless to set up, quick to pack down and fits everything you’d need for an overnight stay, including the super-comfortable mattress – just add sleeping bags and pillows! With cool mesh ventilation that keeps the bugs at bay, and a removable storm cover overhead, you can enjoy the cool breeze and star gaze in summer. When the temperature drops, you can stay uber warm thanks to the heavy duty, waterproof canvas outer cover. 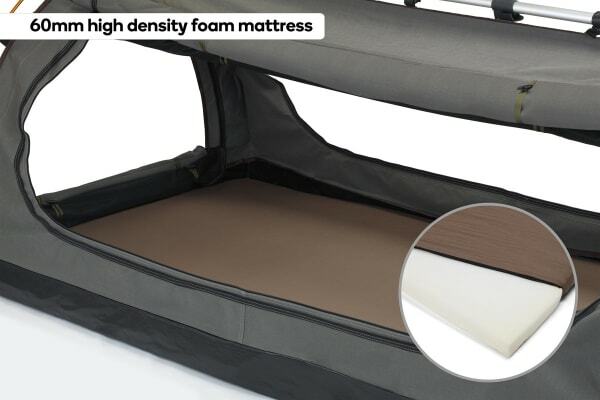 The durable, waterproof PVC floor and high-density sponge mattress add to the warmth, making this hardy swag an extremely comfortable place to lay down your head. 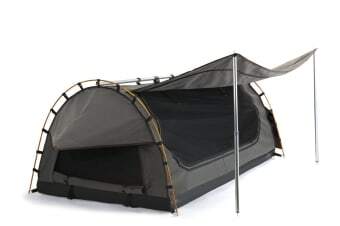 Developed for harsh Australian conditions, the sturdy aluminium poles, 2000mm waterproof and 380gsm ripstop poly cotton canvas make it a tough piece of equipment that’s made to last. 380g Heavy Duty Rip Stop cotton canvas.